WHAT MAKES BD DIESEL'S TORQUE CONVERTERS STAND OUT? Whether hauling a heavy load or running a lot of torque, automatic diesel trucks rely on the performance of their torque converters to translate engine power into drive power. The problem is, when pushed, stock converters tend to slip, causing oil foaming and overheating problems as well as degradation of lock-up clutch material. Over time, or in demanding situations, the front cover of stock converters warp. Ridges on the back of the covers (where attachment nuts were welded on) protrude and decrease the friction surface area between the cover and the clutch disks. To address these failures, BD Diesel has designed performance torque converters that can handle the demands of high-torque and heavy-load driving situations. They include both their Standard Torque Converters and their high performance Triple Force Torque Converters. 2X the lock-up clutch material compared to stock converters. More durable cover plates that are machined rather than welded to create an even, solid point of connection between the cover and the clutch disk. Furnace-brazed turbine and impellor fins. Separately-balanced turbine and pistons for precision performance. An improved stator design built with cast aluminum. 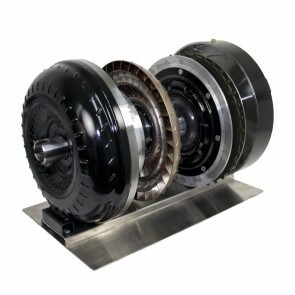 In an automatic truck, the torque converter essentially performs the function of a clutch pedal in a manual truck. It translates engine revolutions into wheel revolutions by creating a gradual, smooth connection between the crankshaft (which is turned by engine combustion) and the input shaft (which in turn drives the gears and the wheels). A torque converter essentially consists of two identical, attached turbines that sandwich a smaller, detached turbine (called the stator). When drive is applied to the converter, the outer two turbines spin and fluid is passed through them. As the fluid passes from one converter turbine to the other, it is forced through the free-standing stator turbine in the middle. The pressure from the fluid against the stator turbine's blades causes the stator to rotate. Because of the hydraulic dynamic, however, the rotation of the stator is not immediately equal to the rotation of the converter turbines. There is a brief ramp-up period as the ratio between the stator RPM and the converter turbines' RPM narrows. When the converter and stator are spinning at the same rate of speed, the lock-up clutch connects and takes over the job of turning engine RPMs in to actual wheel rotations.